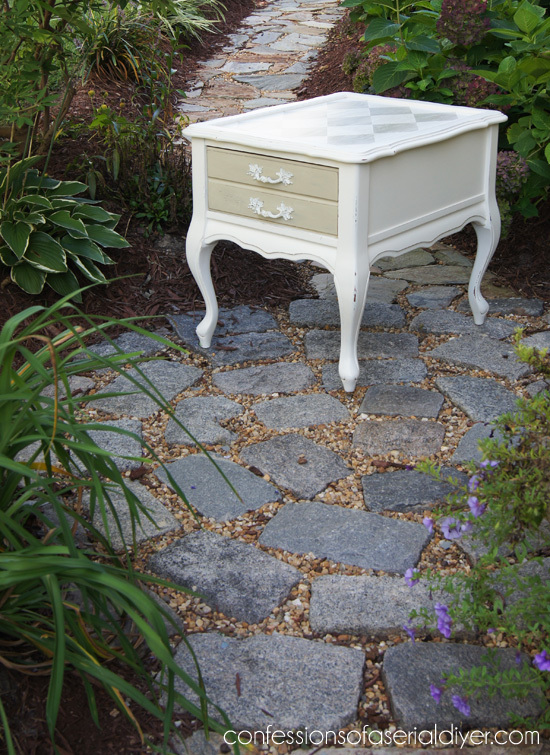 On Thursday I shared a play-by-play in real-time on my Facebook page as I was making over this sweet side table. It was fun having everyone weigh in during the process. 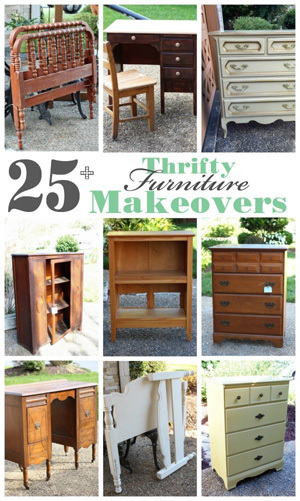 If you missed it, I found this table at my favorite thrift store. I should take a picture of this place. It is so packed and the aisles are so narrow, you can hardly pass someone without frisking them. It’s my favorite because I always find something there, and the merchandise is priced to sell. 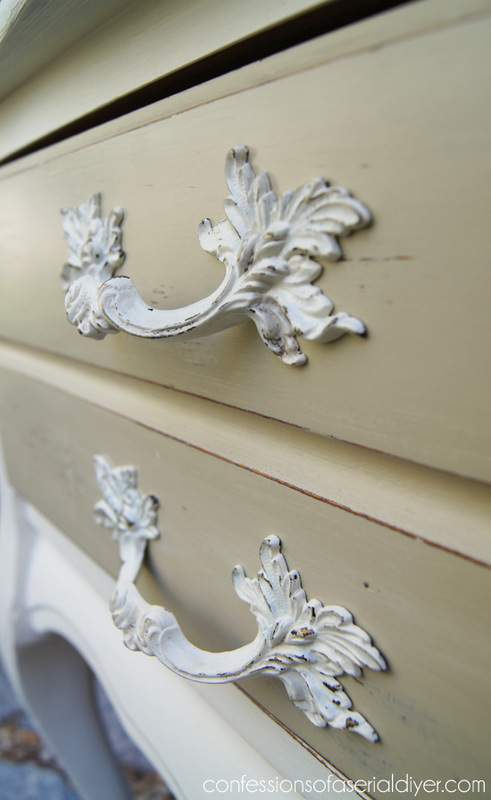 This is DIY chalk paint in Behr’s Cottage White. 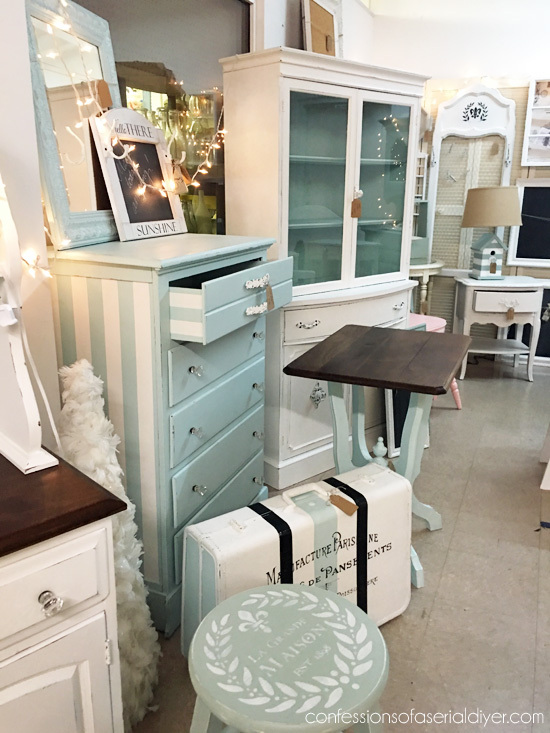 The drawer and harlequin pattern are painted in Annie Sloan’s Country Grey. 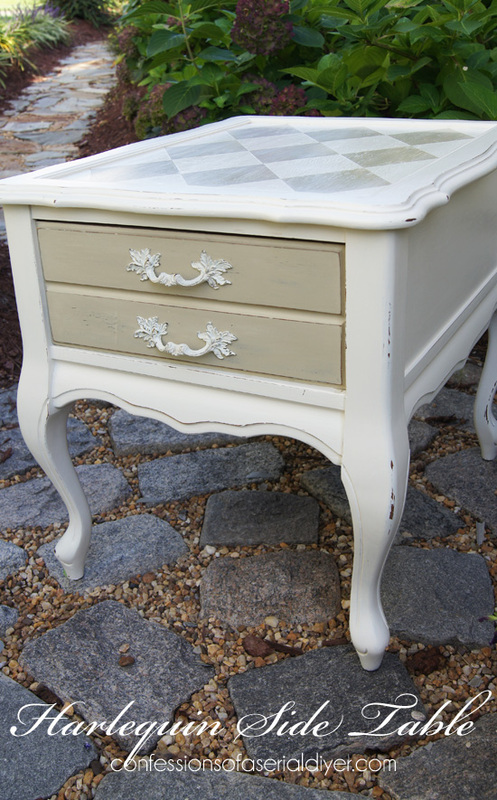 A light sanding and a coat of Annie Sloan’s clear wax finishes this piece off perfectly. These are the original handles that also got a coat of DIY chalk paint, followed by a little sanding and spray acrylic sealer in a matte finish. So pretty! 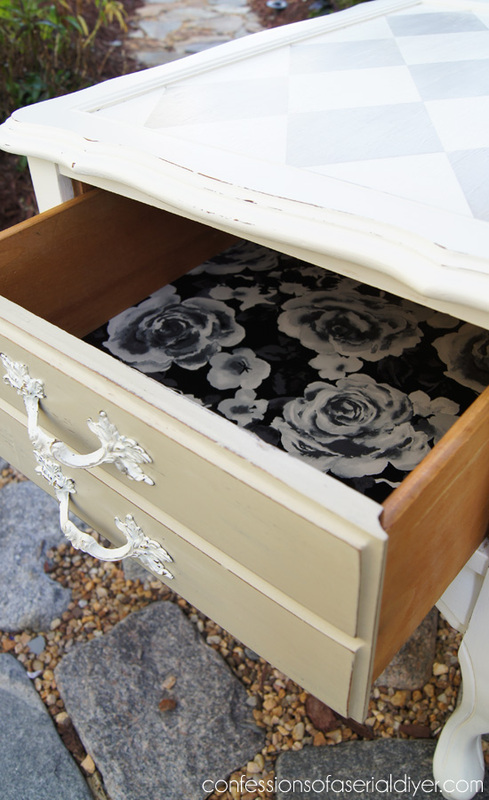 The drawer was freshened up with some pretty drawer liner I found at TJ Maxx. 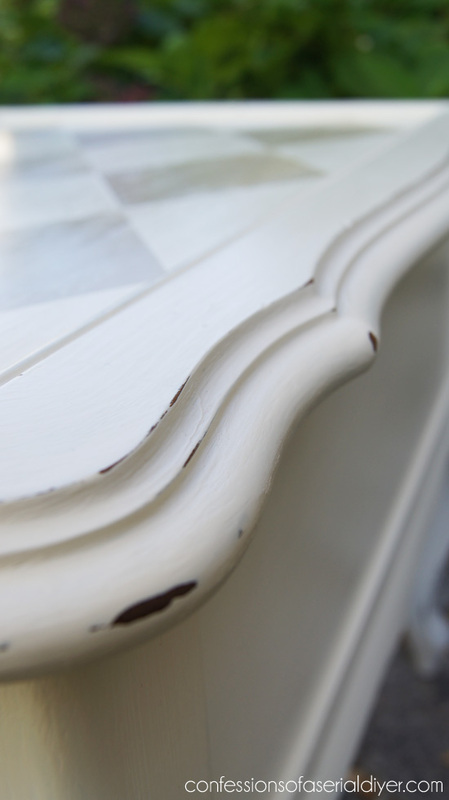 I love these curves , very similar to one of my favorite table makeovers, the step side tables I recently redid. I show you how easy it is to get the perfect harlequin pattern here. Christy, this is amazing! You are so, so talented! I love the colors you chose, and the harlequin pattern is perfect. Have a wonderful week! Fresh and lovely! You got my attention at the mention of harlequin. 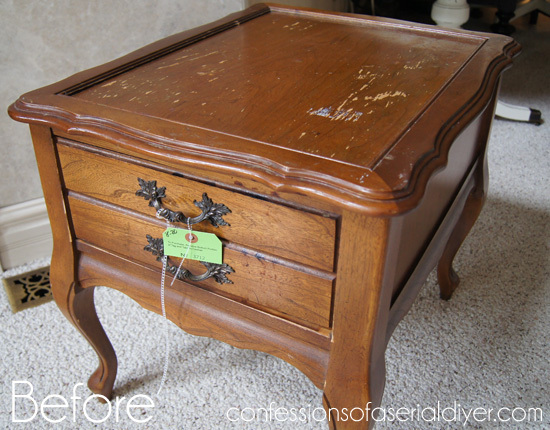 Beautiful transformation – love the color choices and the pattern. Thanks for sharing this $9.98 beauty at my party…wonderful look!! 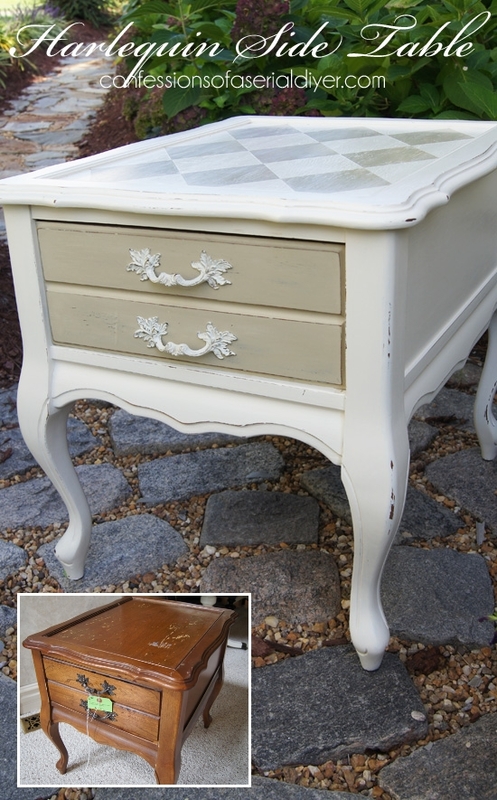 Awesome Christy… the harlequin is perfect and I love the distressing and the way the handles look painted out. Fabulous job- once again!! This looks great! I love the way you painted it! I”m co-hosting Tell Me Tuesday this week and you should come link up with us at http://www.craftdictator.com!! This is just darling Christy. Great job! 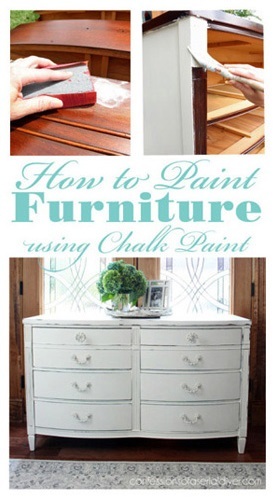 Love harlequin patterns on furniture – haven’t done it in a while – maybe it’s time again after seeing this! Christy, you and I must be on the same creative wave right now. I just redid a cubby with the same colors but painted stripes. I am still in the “not sure if I love it and should I change it stage”. I am loving your diamonds !! Fantastic makeover as always Christy! I love the colors you used. Thanks for sharing on Fluster’s Creative Muster. Absolutely love this – the colours, the pattern, everything! What is Cottage White like? It’s so hard to tell from computer screens. Is it an off-white? I’m looking for a bone white shade. Wow! 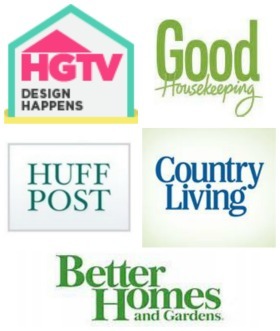 Just trying to catch up visiting my favorite blogs (yours is one), and you’ve been busy! First of all, I cannot believe that any place would seriously sell that beautiful little end table for $9.98. I wanna move where you live, geez! Second of all, I can’t believe how fabulous it looks despite you painting it all over. 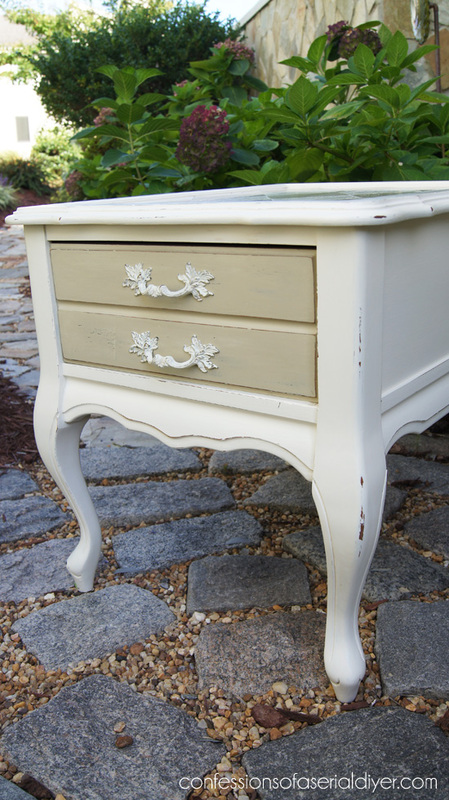 I’m a fan of dark natural wood and the thought of painting a piece of furniture makes me faint. 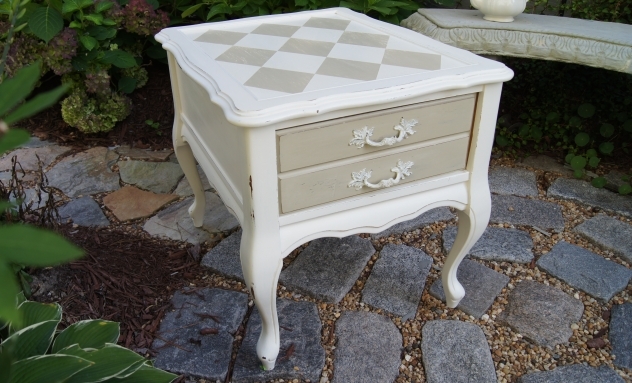 But yours looks great, and I love the Harlequin patterned top and the slightly darker color you used on the drawer fronts. Just the right amount of contrast so the piece doesn’t read shabby chic blah! Oh listen to me, I’m a critic now, har 🙂 I’ll be by again soon. I can’t visit you at Facebook because I terminated my account there last November. 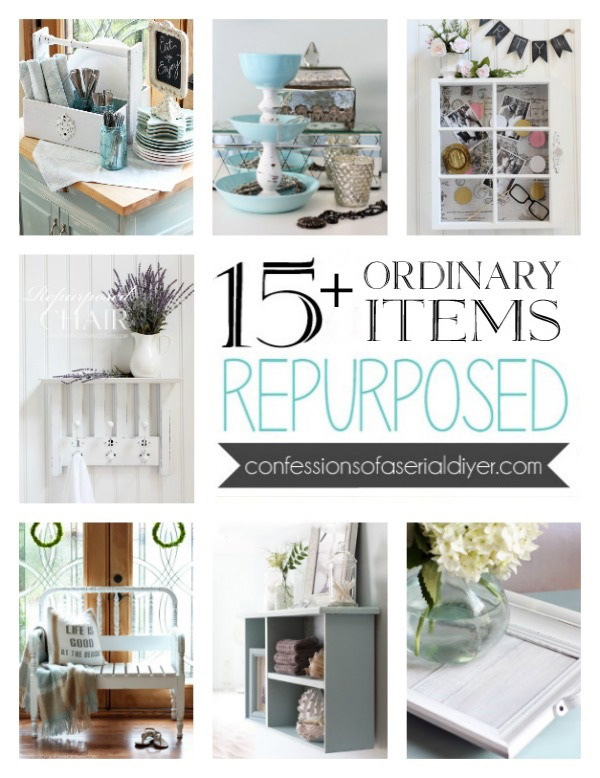 Popping by from Pursuit of Functional Home! What an awesome find. I can’t believe you paid 10 bucks for that beauty! Love what you did with it too. Now I am headed over to your circular granite patio to see what other amazing works of art you have created! Thanks so much! This was a steal of a deal for sure! I love the harlequin pattern. The table turned out just darling! I am featuring it at my party tomorrow. Wow, I love your website. My friend told me about it and I am sooooo excited. Thanks for all the ideas and directions. I have seen these end tables 1000 times over the years but now that you helped show me how beautiful it can turn out, I’ll probably never see another one;) I’m definitely going to be on the lookout! This is so cute. I love that pattern!